There’s probably a very interesting history of Peveril of the Peak Pub, but I haven’t read it yet on Wikipedia. I was in such a hurry to paint it that I wasted no time in reading. I’ve been looking at images of Manchester, especially around Castlefield where my workshop will be held, and this building kept popping up. It’s surrounded by taller brick buildings so it took a bit of time to locate, but how can you not sketch this? Shiny yellow and green tile facade, ornate window and door frames, whimsical chimney pipes, an odd polygon shape… such a joy to behold. The Urban Sketchers Symposium starts in a couple of days and I’m already starting to see sketchers around the city. By the time everyone gets here on Wednesday we will be a small army, close to 500 of us in all, if I remember correctly. From the short stroll I took through the city, I can see that Manchester, with its complex industrial heritage, will be a fascinating place to draw. Wow! Shari, you have captured this building beautifully! Love the colors! Much more beautiful than the picture! Fabulous color, wish I were there. Is there a particular blog where you listed the greens you brought with you or did you mix? A few weeks ago I did a post on my palette for Manchester. It’s called “23 for Galway and Manchester”. Have a look in my archives. Agree-your painting shows more character than the photo. So you are in England now. Wish I could be there. A great spot! And terrific sketch. Did you go in for a pint? It looks even better in your work! I ♥ it.To bits. I am practicing fruits here in a wet and overcast QC here..
Love this yellow building. Beautifully done. You certainly could not pass up this interesting colorful pub. 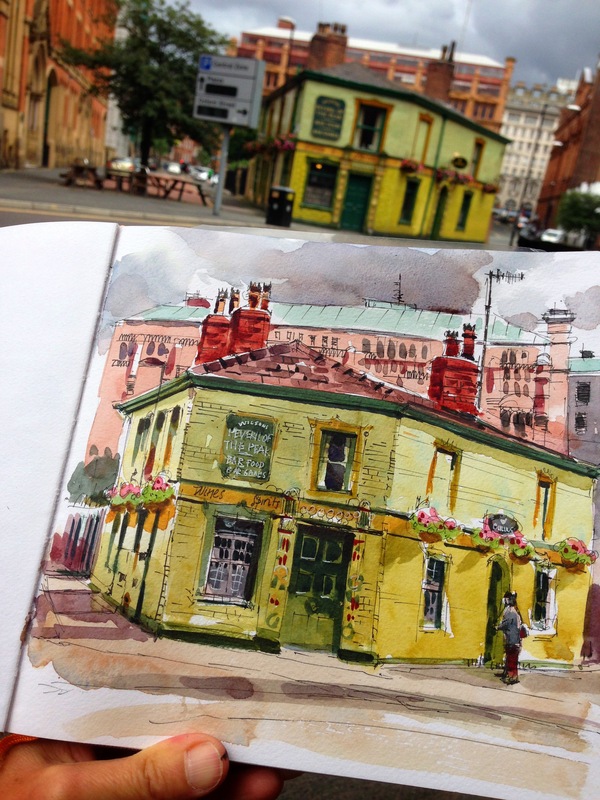 A great start to your sketching adventure in Manchester, Shari. I will look up some of these places on Google Earth like I did last year when you were traveling and posting sketches from your locations. 500 people! Yes! A small art army indeed. Best wishes for a very successful and enjoyable symposium. I will be watching for Parka’s videos too. All of you are famous now. Beautiful scene and sketch. You will all have a blast. Thanks Julana! It is quite a huge group here in Manchester, a big sketcher party , really! Beautifully done. Your skills in potraying the scene in sketch are excellent. You made it look even more special than it looks IRL. Lovely!! Wish I could be with all of you. From something so stiff and angular you painted a whimsical interesting building. You always work miracles! I am having problems when coloring when the weather is cloudy just like in your picture. Like the front wall and the right wall of the 2nd floor looks the same color to me >.< Do you improvise on the lights and darks in some cases? I sometimes improve lighting conditions if the light is very flat, but for this I didn’t. The facade of the building was in shadow and the right side of the building was in sun. But interestingly, the left side of the building was lit by reflected light from the building next to it so that’s why the building has two sides that are lit. Your watercolour is just better than reality. Love the colours and how bright you make them see! Your colors are spot on! So beautiful!! You are so good at color mixing and have an eye for making a scene even more beautiful then it is.